This DNA biobrick was designed in order to produce cOT2 antimicrobial peptide. Antimicrobial peptides (AMP) are phylogenetically ancient components of the innate defense of both invertebrates and vertebrates. In the context of growing bacterial antibiotic-resistance, these AMP are considered as potential new therapeutical candidates. Crocodile ovotransferrin 2 peptide (cOT2) is an engineered peptides coming from the siamese crocodile. It bears the natural sequence of cOT1 and has been extended based on the C. siamensis transferrin amino sequence to increase its natural antimicrobial activity The peptide is a 29 amino acid residue : KKSCHTGLKKSAGWVIPIGTLVKNGIIVR. The mechanism of action of cOT2 has been observed scanning electron microscopy. This cationic and amphipathic molecules is able to attach to and insert into membrane bilayers to form pores triggering bacterial cell lysis. The part was designed during the Croc’n Cholera project (team INSA-UPS-France 2017). It produces the cOT2 AMP when associated with a yeast promoter. The α-factor (BBa_K1800001) sequence contains a RBS and a signal sequence to secrete the produced peptides. The gene was placed under the control of an alpha factor signal. IDT performed the DNA synthesis and delivered the part as gBlock. The construct was cloned by conventional ligation into the pSB1C3 plasmid. The construction was then inserted on plasmid pPICZa and integrated in the yeast genome. Figure 1: Analysis of the restriction map BBa_K2278023. Digested fragments (XbaI and PstI) are electrophoresed through a 1% agarose gel. Control vector pSB1C3 contained an insert and expected size were 2034 and 700 bp (digestion was not total, hence the 2734 bp fragment). The fragment lengths of the correct clones (#2 to #5) were 2035 bp and 385 bp for the required insert. Figure 2: Sequencing of pSB1C3-cOT2 1500 ng of plasmid are sequenced. The obtained sequence were blast on the BBa_K2278023 sequence with the iGEM sequencing online tools. The sequencing successfully validated the sequence of the biobrick. The biobrick was placed under the control of the pAOXI promoter and was cloned in the pPICZalpha vector, an expression vector for the yeast Pichia pastoris. The plasmid was then linearized and transferred in Pichia pastoris by electroporation. The integration is predicted to be at the pAOXI location. Indeed, the pAOXI promoter makes genome recombination easier in Pichia pastoris. 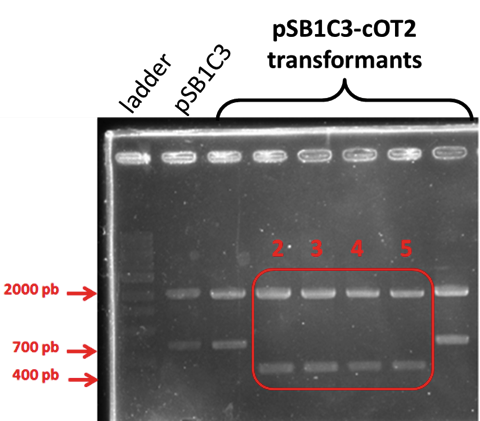 Figure 3: Integration of pAOXI+BBa_K2278023 in Pichia pastoris To verify the correct integration, we performed colony PCR and electrophoresed the product through a 1% agarose gel. A 307 bp fragment is expected if the integration is correct. Correct amplifications were observed for the 2 colonies tested and the positive controls with the D-NY15 fragment as matrix (D-NY15). Negative control with pPICZalpha presented a non specific amplification band with a size inferior the 307 bp. cOT2 production was performed with Pichia pastoris rown for 4 days at 30 °C with shacking in YPD 40 g/L glucose plus methanol to trigger the pAOX1 promoter. Supernatants from yeasts with or without the cOT2 encoding gene were sampled. The supernatants were used in a halo assay against V. harveyi as the target of cOT2. Briefly, 35mL of supernatants were freeze-dried and then resuspended in 3.5mL of water. A paper cut was soaked with one of these solutions and placed on a Petri plate inoculated with V. harveyi (figure 3). 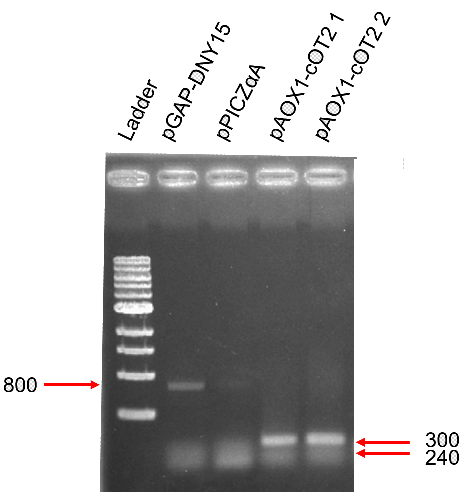 Figure 4: AMP halo assay.Positive control was performed with chloramphenicol (25 g/L), the negative control was performed with the empty plasmid integrated in P. pastoris, the assay was performed with the plasmid containing BBa_K2278023 integrated in P. pastoris. No inhibition halo was observed around the yeast patch. The cOT2 cytoxicity can not be demonstrated. Higher concentration of yeast supernatants could be tried. The peptides DNA sequence has been obtained by reverse translate the amino acid sequence of cOT2 proposed by Prajanbanet al., 2011. They had determinated the amino acid sequence by mass spectrometry analysis. Prajanban, B., Jangpromma, N., Araki, T. and Klaynongsruang, S. (2017). Antimicrobial effects of novel peptides cOT2 and sOT2 derived from Crocodylus siamensis and Pelodiscus sinensis ovotransferrins. Biochimica et Biophysica Acta (BBA) - Biomembranes, 1859(5), pp.860-869.